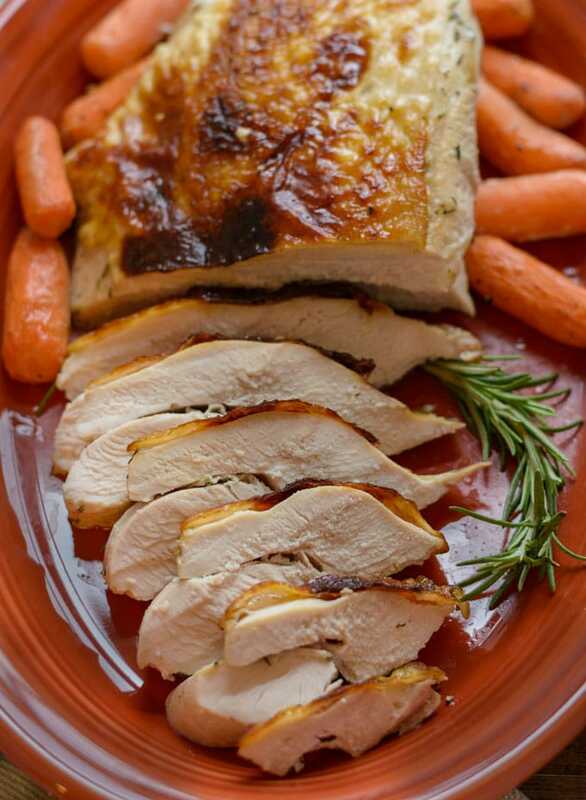 Brined in buttermilk with rosemary, thyme and sage, this Roasted Turkey Breast is super moist and incredibly tender! 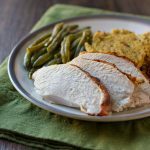 If you’re having a small Thanksgiving dinner, this roasted turkey breast makes the perfect main course to serve your guests! That buttermilk brine creates the most tender turkey meat. I’m not even a huge turkey lover, and I really enjoyed it! After watching Salt, Fat, Acid and Heat show on Netflix, I decided I wanted to brine my turkey in buttermilk. The chef on the show brined a whole chicken and it looked amazing. I found the whole series really interesting and informative. If you like to cook you should check it out on Netflix or get a copy of her book by the same name. There are a variety of turkey brine recipes out there, but I brine mine in buttermilk mixed with herbs and sea salt. In a large measuring cup, pour 2 1/2 cups of buttermilk. Whisk in some garlic powder, fresh rosemary, dried thyme, ground sage and sea salt until combined. Pour the mixture into a large food storage bag. Add the turkey breast to the bag. Carefully squeeze as much air out as you can, then seal the bag. Place the bag into a bowl to catch any leaks, then place into fridge for at least 12 hours. About one hour before you plan to cook the turkey breast, remove it from the fridge and allow it come to room temperature. Remove the turkey breast from the storage bag, drain well, and use paper towels to pat it dry. 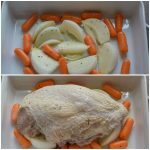 Place a roasting rack into a baking dish or roasting pan with low sides, then place the turkey on top. If you don’t have a roasting rack, you can use some thick cut vegetables to elevate the turkey breast off the bottom of the pan as I’ve done below. It depends on the size. For 2.25 – 2.5 pounds of turkey breast, it took between 85-90 minutes. Keep a check on the turkey once you’ve turned the heat up during the last 10-15 minutes to ensure that it doesn’t burn on top. You can tent it with some foil if it’s looking too dark. Be sure to get a fresh turkey breast as they typically have not been injected with a saline solution. Otherwise, the turkey meat will be way too salty. 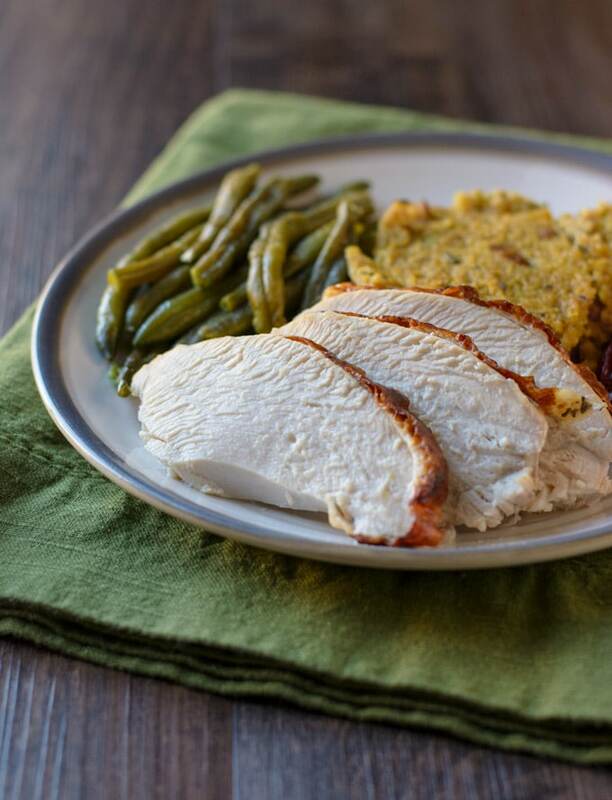 An herb seasoned buttermilk brine makes Roasted Turkey Breast super moist and tender! In a large measuring cup, whisk together the ingredients for the brine. Place the turkey breast into a large food storage bag, then pour the brining liquid over top. Carefully remove as much air as you can, then seal the bag. Place into a large bowl or dish to catch any leaks and place into the fridge for 12-15 hours. About one hour before you are planning to cook the turkey breast, remove it from the fridge and let come to room temperature. Place the carrots and onion (if using in place of a roasting rack) into a large bowl. Add the olive oil and toss to coat. Remove the turkey breast from the storage bag, drain well, and use paper towels to pat it dry. Place a roasting rack or the cut up onion into a baking dish or roasting pan with low sides, then place the turkey on top. Arrange the carrots around the turkey . 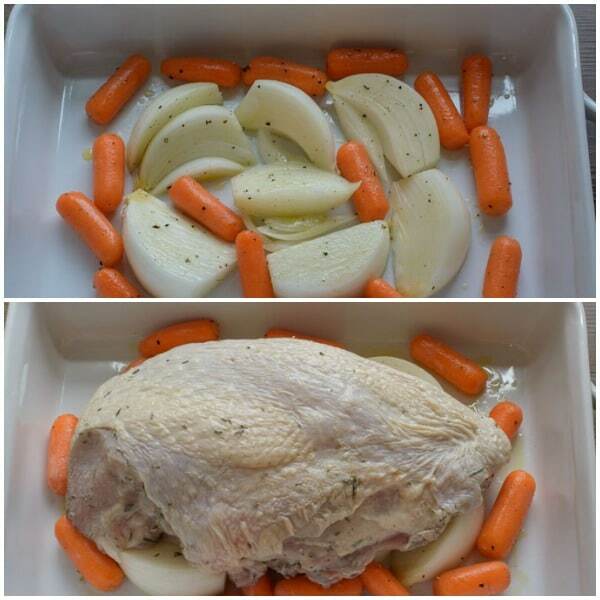 Place into the oven and roast for 1 hour and 15 minutes. Turn the oven up to 400°F and let cook for another 10 to 15 minutes, or until a food thermometer reads 160°F. Remove from the oven, tent the turkey with a piece of foil and let sit for 15 minutes before cutting to allow the juices to redistribute. Cut the meat off the bone, then, cutting across the grain, slice the turkey breast to whatever thickness you like. Keep a check on the turkey once you've turned the heat up during the last 10-15 minutes to ensure that it doesn't burn on top. You can tent it with some foil if it's looking too dark. By Tempie at November 17, 2018 .